Click the "SMS / Voice" command on the Options menu. Click the Settings button when configuring a text message reminder or phone reminder for an event or task. The SMS/Voice tab of the Options Window enables you to specify your text messaging and phone settings. These settings are used by VueMinder when sending text message reminders and voice reminders. If you don't plan on using those reminder types, then you don't need to specify these settings. You can use your own mobile carrier for sending text message reminders. This option doesn't require any additional service plan. However, your mobile carrier might not be compatible, especially if you're located outside the United States or Canada. This option doesn't provide the ability to send voice reminders via phone calls. You'll need to know the mobile carrier of any other people you'd like to send reminders to, and their carriers will also need to be compatible. Email settings need to also be entered before this option will work. You can use the web-based SMS service. This option enables voice reminders to sent, in addition to SMS reminders. This is the recommended option, since it simplifies setup and you don't need to know the mobile carrier of other reminder recipients. You don't need to enter your email settings. SMS reminders sent using the web-based service are reasonably priced, usually between 6 and 10 cents ($0.06 to $0.10 USD) per reminder. Signup is free and there is an option to pay as you go, instead of being locked into a monthly contract. If you already have an account with a different web-based SMS service, you could select the "Use other provider" option. This option is for advanced users and is not guaranteed to be compatible with all web-based SMS providers. To use your own mobile carrier for sending SMS reminders, click the first option. 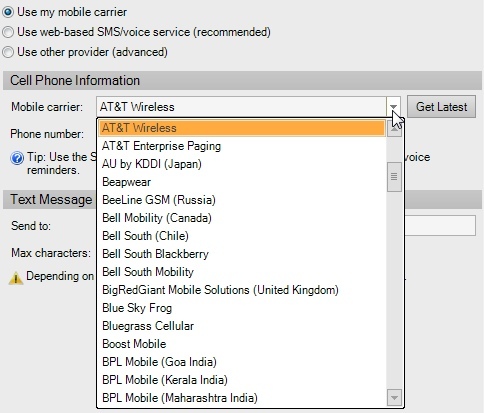 To configure VueMinder for text messaging through your mobile carrier, select your carrier from the list. 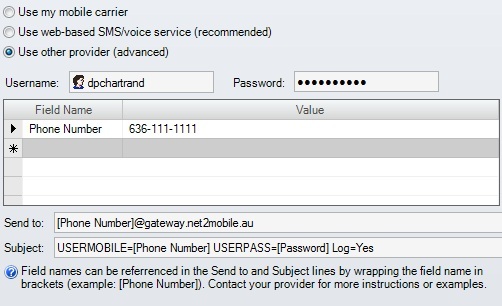 When a carrier is selected, the SMS send-to address for receiving text messages is automatically determined. If your carrier is not listed, click the "Get Latest" button to download the latest list from VueSoft. If after doing this your carrier is still not listed, it's likely your carrier isn't compatible. In that case, we recommend using the web-based SMS service, which is compatible with almost every mobile carrier. After selecting your mobile carrier, you'll also need to enter your phone number. Depending on the selected mobile carrier, this may be used to determine the send-to address. Some mobile carriers require a username for text messaging instead of a phone number. When this is the case, a "User name" field will be shown where you can enter your user name. This will be used to determine the send-to address. After selecting a mobile carrier and entering your phone number (and possibly user name), the send-to address will automatically update. You can manually change this if it is incorrect. The maximum number of characters in the text message will also be automatically determined based on the selected mobile carrier. If the value is incorrect, you can adjust it. If you find you need to modify either of these fields, please let us know so we can update our information. After your enter or modify your text messaging or email settings, it's advised that you send a test message to ensure VueMinder will be able to correctly send text message reminders. Click the "Send a Test Message" at the bottom of the Options window to initiate the test. If you don't receive a text message after waiting several minutes, double-check both your text messaging and email settings to ensure they are correct. 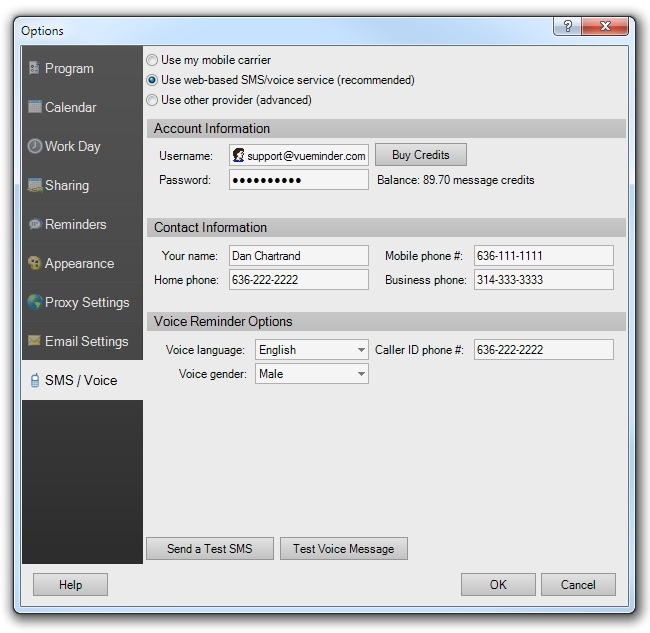 To use the web-based SMS/Voice service, click the option at the top of the window. If you don't have an account, you can request one here. It's free to sign up and you'll receive an account within a few minutes. Enter your username and password here. If this is a new account, you should receive your login information within a few minutes of creating the account. Additional credits can be purchased at any time by clicking the "Buy Credits" button. The current balance will be shown, and you'll receive an email when your credit balance approaches 0. A name and mobile phone number will need to be specified. You can also specify a home and business phone number. These are used when a voice reminder is configured to call your home or business number instead of your mobile number. For voice reminders, you can select the desired voice language. Currently, supported languages are English, French, and Spanish. The voice gender can be selected via a drop-down. The caller ID number can be specified. We recommend entering a value here, in case your reminder recipients screen their calls or would like to call you back regarding the reminder. You can select this option if you already use a web-based SMS provider and don't want to use the SMS/Voice service recommended by VueSoft. The settings under this option will require some advanced knowledge about the send-to and subject lines required by your SMS provider. Enter the username and password for connecting to your SMS provider. If you require these values in the send-to or subject lines, the username field can be referenced as "[Username]" and the password as "[Password]". If your provider requires additional fields in the send-to or subject lines, these can be entered in the list. Each field name can be referenced in the send-to or subject lines by wrapping the field name in square brackets. For example, if the field name "Phone Number" is required in the send-to line, you can dynamically reference this field in by using "[Phone Number]". The specified phone number value will be inserted into the send-to line when an SMS message is sent. When sending to other recipients, their phone numbers will be used instead. You don't need to update this option each time you want to send a reminder to a different recipient. This is the send-to line. 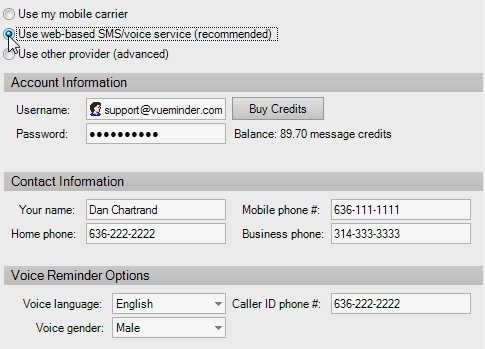 VueMinder will send an email to your SMS provider. Most web-based SMS providers accept inbound email and will convert the email to a text message for delivery to the phone number specified by the send-to line. This is the subject line. Many web-based SMS providers require account or authentication in the subject line. Contact your SMS provider if you're unsure about the required values. Also, if a password is needed, we strongly advise using the "[Password]" field name reference, instead of hard-coding the password into the subject line. This will ensure the password remains encrypted and secure. After entering your settings, we recommend using the buttons at the bottom of the window to send a test message. Clicking this button will send a test SMS to your mobile phone. You should receive the SMS within a few minutes. If you don't get the SMS, your settings might be incorrect, or your mobile provider might not be compatible. Clicking this button will call your mobile phone with a voice test. You'll be able to hear what the voice sounds like, as well as ensure the correct caller ID number appears. You should receive the phone call within a few seconds. This button is only visible when using the web-based SMS/Voice service. Users outside the United States and Canada might need to requires the web-based service to enable international messaging on their account before voice reminders can be successfully sent.